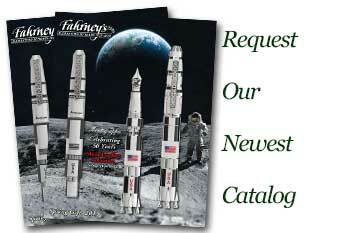 Order your William Henry Limited Edition Cabernet Etched Damascus Rollerball today from FahrneysPens.com. Fine Pens, Refills & Luxurious Gifts – great prices & fast shipping. The Cabernet Etched Damascus rollerball by William Henry was created with a striking design, gorgeous materials and timeless workmanship. With these aspects perfectly combined, the Limited Edition Etched Damascus rollerball is regarded as a tool of superlative function and stature. Etched Damascus makes up the barrel and cap, accented by titanium and ebonite. The barrel design also features a citrine gemstone set in the clip and a black silver medallion. The patent-pending cap closure system is made with a ring of chromium steel balls embedded in a titanium ring captured in wave-shaped grooves in titanium collars for closed and post positions. Integrated with a spring loaded system in the cap, the cap locks securely in place with an easy and comfortable release. Each William Henry Limited Edition Cabernet Etched Damascus rollerball is part of a limited edition of 250 pieces, each engraved with an individual serial number inside the cap. The William Henry Limited Edition Cabernet Etched Damascus rollerball is made in the USA.